The Banu ʿAbs (Arabic: بنو عبس‎, lit. 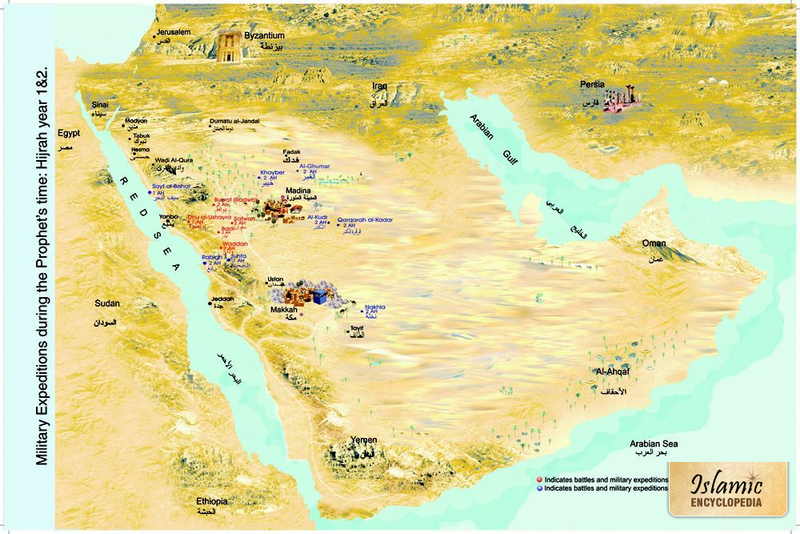 "sons of ʿAbs") are an ancient Bedouin tribe from central Arabia. They form a branch of the Ghatafan tribes. They still inhabit the Arabian Peninsula and North Africa. 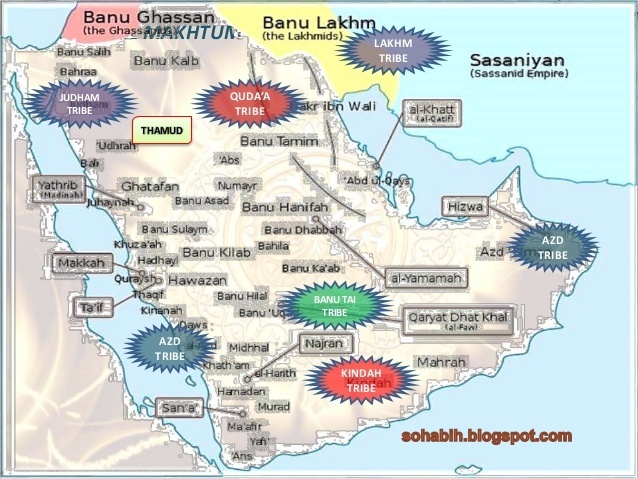 Of the earliest stories concerning this tribe was the famous classical love and war story The Banu ʿAbs originate almost 2,000 years ago branching from the Ghatafan clan, and had inhabited and still inhabit the outskirts of Hail in modern Nejd in an area called today Hurrat Bani Rasheed. 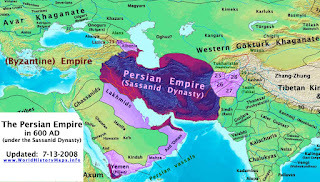 The Tribe is known for its independence and bravery, as it had been called one of the Jamarat of the Arabs, or the most powerful tribes that took no allegiance to anyone but themselves. The earliest stories regard tales of war and chivalry before Islam, in the famous war of AlDahhas wil Ghabraa, between them and their cousins Bani Thibyan, which had lasted almost 40 years. The war had ended when the King Zuhair of the Banu 'Abs, had called for an end to the bloodshed, asking the wealthy merchants of both tribes to pay the losses caused by the war. Before he had died King Zuhair had predicted like many Christians and Jews before him that there will arrived a Prophet that will unite humanity under God's rule, and had advised for his tribe to follow the future Prophet with all allegiance. Soon, enough, they had willingly done so, and Islam had become their religion, and the whole tribe had humbly converted before the Hijra of the Muslims to Madinah. One of the known person of Banu Abs , ʿAntarah ibn Shaddad al-ʿAbsi (c. 525-615) was one of the seven great pre-Islamic Arab poets and the architect behind the great story Antar and Abla. Throughout this non-fiction story, he displayed chivalry, bravery, and eloquence in the Arabic language. This earned him the name among all of the Arabs of the Peninsula as the "Complete Knight". Furthermore, he was the author of the Divan and he was a Warrior, his father was a leader of the Banu ʿAbs Shaddad and his mother was Zabiba, an African slave who was captured in battle. 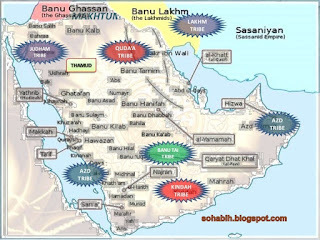 The Banu ʿAbs are of the Northern "Arabized" Arabs and the tribal name leads to Adnan (father of Northern Arabs) and the full name is Abs ibn Bughaydh ibn Raith ibn Ghatafan ibn Sa'd ibn Qais Aeelan ibn Modhar ibn Nizar ibn Ma'd ibn Adnan.They are relatives to many tribes in Arabia and are far cousins of Quraysh, Banu Tamim, and Kinanah. Also part of the Ghatafan tribes close to the Banu ʿAbs are the Mutair and Thibyaan. The large and prestigious Rasheed tribe is descended from the Banu ʿAbs. 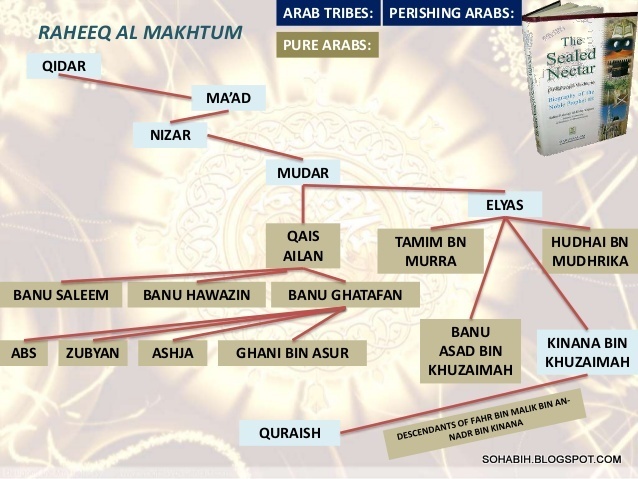 The great-grandfather of the Bani Rasheed is Rasheed al Zaul of the Banu Abs tribe. 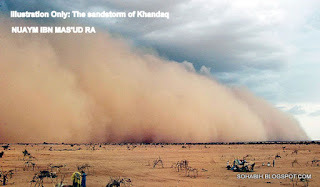 Then Expedition of Abu Qatadah ibn Rab'i al-Ansari (Khadirah) in November or Dec 629, the Expedition of Abu Qatadah ibn Rab'i al-Ansari (Khadirah) took place. With the goal of attacking the Ghatafan tribe because he heard that they were amassing troops and were still outside the "domain of Islam"
The Tribe of Ghatafan - Illustration Only. "When they came upon you from above and from below you, and when eyes grew wild and hearts reached to the throats. And you were imagining vain thoughts concerning God. Then were the believers sorely tried and shaken with a mighty shock." 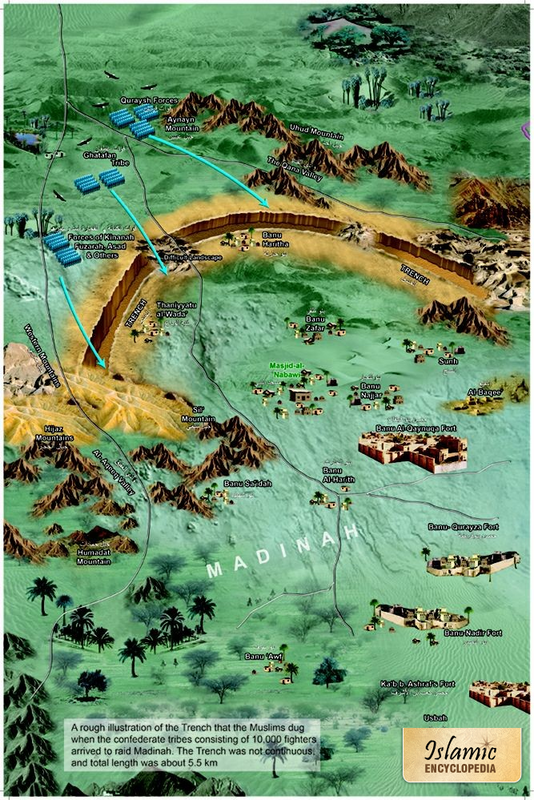 The ditch was just completed when the mighty enemy forces from the north and the south converged on Madinah. 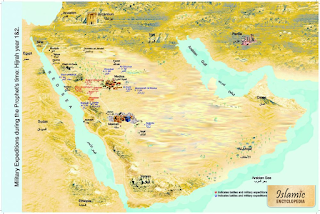 While they were within a short distance from the city the Nadirites conspirators approached their fellow Jews of the Banu Qurayzah who lived in Madinah and tried to persuade them to join the war against Rasulullah SAW by helping the two armies approaching from Makkah and the north. The response of the Qurayzah Jews to the Nadirite leaders was: "You have indeed called us to participate in something which we like and desire to have accomplished. But you know there is a treaty between us and Rasulullah SAW binding us to keep the peace with him so long as we live secure and content in Madinah. You do realize that our pact with him is still valid. We are afraid that if Rasulullah SAW is victorious in this war he would then punish us severely and that he would expel us from Madinah as a result of our treachery towards Muslim." "Muhammad promised us." they said, "that we would gain possession of the treasures of Chosroes and Caesar and here we are today with not d single one of us being able to guarantee that he could go to the toilet safely to relieve himself!" On that night, as Rasulullah SAW prayed, Nuaym Ibn Ma’sud RA lay tossing in his bivouac. 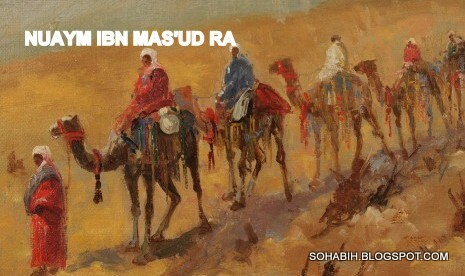 Nuaym Ibn Ma’sud RA could not sleep. Nuaym Ibn Ma’sud RA kept gazing at the stars in the vast firmament above. Nuaym Ibn Ma’sud RA thought hard and long and suddenly he found himself exclaiming and asking: "Woe to you, Nuaym! What is it really that has brought you from those far off places in Najd to fight this man and those with him? Certainly you are not fighting him for the triumph of right or for the protection of some honor violated. Really you have only come here to fight for some unknown reason. Is it reasonable that someone with a mind such as yours should fight and kill or be killed for no cause whatsoever? Woe to you, Nuaym. What is it that has caused you to draw your sword against this righteous man who exhorts his followers to justice, good deeds and helping relatives? And what is it that has driven you to sink your spear into the bodies of his followers who follow the message of guidance and truth that he brought?" When Rasulullah SAW beheld him, standing erect in his presence, he exclaimed, "Nuaym ibn Masud?" "Yes, O Rasulullah!" declared Nuaym. "What has brought you here at this hour?" "I came", said Nuaym, "to declare that there is no god but Allah and that you are the servant of God and His Messenger and that the message you have brought with. Nuaym Ibn Ma’sud RA went on: "I have declared my submission to God, O Messenger of God, but my people do not know of my submission. Command me therefore to do whatever you desire." "You are only one person among us," observed Rasulullah SAW. "So go to your people and act as if you have nothing to do with us for indeed war is treachery." "Yes, O Messenger of Allah," replied Nuaym. And if Allah’s wills, you shall witness what pleases you." Without losing any time, Nuaym Ibn Ma’sud RA went to the Banu Qurayzah. He was, as was mentioned earlier, a close friend of the tribe. "O Bani Qurayzah," he said. "You have known my love for you and my sincerity in advising you." "Yes," they agreed, "but what are you suspicious of so far as we are concerned?" Nuaym continued: "The Quraish and the Ghatafan have their own interests in this war which are different from your interests." "How so?" they queried. "This is your city," Nuaym Ibn Ma’sud RA asserted. "You have your wealth, your children and your womenfolk here and it is not in your power to flee and take refuge in another city. On the other hand, the Quraish and the Ghatafan have their land, their wealth, their children and their womenfolk away from this city. They came to fight Muhammad. They urged you to break the treaty you had with him and to help them against him. So you responded positively to them. If they were to be victorious in their encounter with him, they would reap the booty. But if they fail to subdue him, they would return to their country safe and sound and they would leave you to him and he would be in a position to exact the bitterest revenge on you. You know very well that you would have no power to confront him." "You are right," they said. "But what suggestion do you have?" "My opinion," Nuaym suggested, "is that you should not join forces with them until you take a group of their prominent men as hostages. In that way you could carry on the fight against Muhammad either till victory or till the last of your men or theirs perish. (They would not be able to leave you in the lurch)." "You have advised well," they responded and agreed to take up his suggestion. Nuaym then left and went to Abu Sufyan ibn Harb, the Quraish leader and spoke to him and other Quraish leaders. "O Quraish," said Nuaym Ibn Ma’sud RA, "You know my affection for you and my enmity towards Muhammad. I have heard some news and I thought it my duty to disclose it to you but you should keep it confidential and do not attribute it to me"
"You must inform us of this matter," insisted the Quraish. Nuaym continued: "The Banu Qurayzah now regret that they have agreed to participate in the hostilities against Muhammad. They fear that you would turn back and abandon them to him. So they have sent a message to Muhammad saying: 'We are sorry for what we have done and we are determined to return to the treaty and a state of peace with you. Would it please you then if we take several Quraish and Ghatafan nobles and surrender them to you? We will then join you in fighting them - the Quraish and the Ghatafan - until you finish them off.' Rasulullah SAW has sent back a reply to them saying he agrees. If therefore the Jews send a delegation to you demanding hostages from among your men do not hand over a single person to them. And do not mention a word of what I said to you." "What a good ally you are. May you be rewarded well," said Abu Sufyan gratefully. Abu Sufyan wanted to test the Banu Qurayzah so he sent his son to them. "My father sends greetings of peace to you,” began Abu Sufyan son. "He says that our siege of Muhammad and his companions has been a protracted affair and we have become weary...We are now determined to fight Muhammad and finish him off. My father has sent me to you to ask you to join battle with Muhammad tomorrow." "Damned be the sons of monkeys and swine! By God, if they were to demand from us a single sheep as a hostage, we would not give them". That very night Rasulullah SAW had sent one his companions, Hudayfah ibn al-Yaman, to get information on the enemy's morale and intentions. He brought back the news that on the advice and initiative of Abu Sufyan, the enemy had turned on their heels and fled... The news quickly spread through the Muslims ranks and they shouted in joy and relief! Three years after the Battle of the Ditch, on the day the Muslims marched victoriously into Makkah, Abu Sufyan ibn Harb stood surveying the Muslim armies. He beheld a man carrying the Ghatafan flag and asked: "Who is this?" "Nuaym ibn Masud," came the reply. "He did a terrible thing to us at al-Khandaq," Abu Sufyan confessed. "By God, he was certainly one of the fiercest enemies of Rasulullah SAW and here he is now carrying his people's flag in the ranks of Rasulullah SAW and coming to wage war on us under his leadership." Nuaym Ibn Mas'ud RA continued: "The Banu Qurayzah now regret that they have agreed to participate in the hostilities against Rasulullah SAW. They fear that you would turn back and abandon them to him. So they have sent a message to Rasulullah SAW saying: 'We are sorry for what we have done and we are determined to return to the treaty and a state of peace with you. Would it please you then if we take several Quraish and Ghatafan nobles and surrender them to you? We will then join you in fighting them - the Quraish and the Ghatafan - until you finish them off.' Rasulullah SAW has sent back a reply to them saying he agrees. If therefore the Jews send a delegation to you demanding hostages from among your men do not hand over a single person to them. And do not mention a word of what I said to you." Rasulullah SAW praised and gave thanks to his Lord for His deliverance from the threat posed by the mighty alliance. 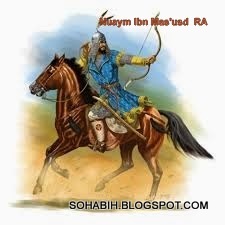 Nuaym, as a result of his subtle but major role in the blasting of the alliance, gained the confidence of Rasulullah SAW who entrusted him thereafter with many a difficult task. Nuaym Ibn Mas'ud RA became the standard-bearer of the Prophet on several occasions. I heard Rasulullah SAW say when he read the letter of Musailamah: What do you believe yourselves? They said: We believe as he believes. He said: I swear by Allah that were it not that messenger is not killed, I would cut off your heads.